An enjoyable climb and descent at the head of Glen Clova, with an easy hillop walk across a broad open plateau. This made an easy short hike on a sunny summer's day, linking two old drovers' roads, Jock's Road and the Kilbo Path. In mist, care would have to be taken with navigation on the summit plateau. 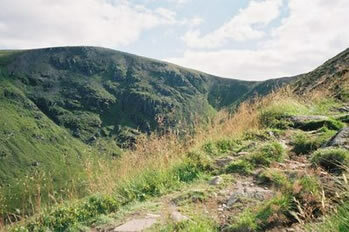 These two munros are within easy reach of the cities of eastern Scotland – Dundee especially, Aberdeen and Edinburgh. I remember most the beautifully sculpted corrie on the way up. The best bit was the lunch break with that view down into the corrie. The worst bit (but not too bad) was hiking through the forest. The funniest bit was the two people sitting on the big boulder in the bottom of the corrie, like life-size garden gnomes. I was also impressed by the strikinig line of descent, along the flank of a rdige, known as the Shank of Drumfollow (the Kilbo Path). The only slightly scary bit, for some, might be the short scrambly sction around the top of the corrie, but there was no serious exposure. Places to eat/ buy food Clova Hotel for meals, Brandy Burn House B&B and tea shop (just across the road from the Clova Hotel). Shops in Kirriemuir.